Jongleurs held its very first New Comic Road Test at The Sugar Club, on Thursday 14th August. In front of a full house, 8 new comedians performed alongside professional Jongleurs comedians, John Moloney & Barry Murphy. 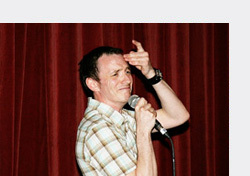 Gearoid Farrelly was voted as the best New Comic by the audience, after bringing the house down with his superb set. Gearoid’s next step to comedy superstardom will be to perform in a Jongleurs Comedy Club in London, and if successful, Jongleurs hope to add him to our portfolio of comedy talent that we work with all over the world. JONGLEURS COMEDY IRELAND LTD - Unit 12, Block D, Nutgrove Business Park, Nutgrove Avenue, Rathfarnham, Dublin 14, Ireland.